The Mallet Band's first recording was done under extreme duress. A lot of sandwiches were consumed, mostly fresh turkey. 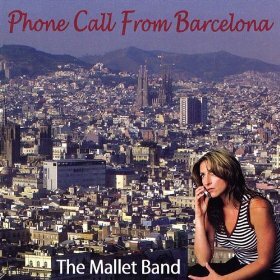 I actually got a phone call from Barcelona one day with some not-so-good news from a very good looking woman, back when I was living in a far away galaxy. Being the fragile, lovesick guy I was, I wrote a tune about it. What's the scoop on the tune "Two Sisters" on the CD? Well, Tommy Kesecker wrote that one, and he was always smiling when we recorded it. I would be smiling, too, if I knew exactly what it was about. What's up with the tune "Free It Up"? Deep, very deep. Tom Miller had originally come in with the tune titled "Tommy Goes To The Grocery Store" and while it was true, Tommy HAD gone to the grocery store, and found his way back, but we didn't think it was cool enough. Even the Mallet Band has it's limits. It had no title at all. It's working title became, uh, "We'll Look Into It"
Can we hear some tunes?